That’s right I think” he said when I asked if his mate did the sit-ups with his feet locked under underneath something. Now abdominal crunches are one of the easiest and best postural strengthening exercises but if you lock your feet when you’re doing them it’s risky. The reason is a muscle called Psoas major which makes your hip bend up but it’s also attached to the front of your lumber spine bones. So it also pulls your spine toward your hip. Significantly, if your feet are locked under something. It’s a little hard to explain in words but hopefully my dodgy stick men below illustrate what I mean. 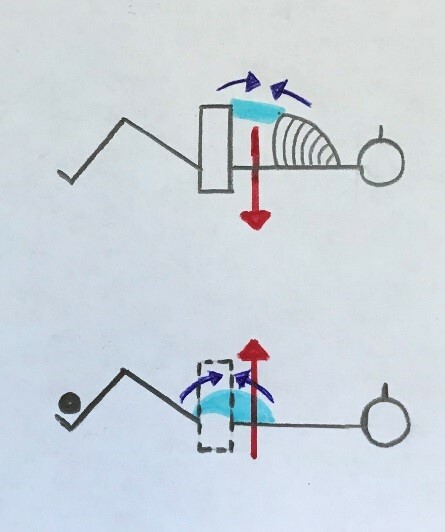 From the arrows you can see the abdominal muscles pulling the chest towards the pelvis in the first diagram (resulting in downward pressure on the lower back while lying). In the second diagram you can see the Psoas muscle pulling the back towards a fixed leg resulting in upward force on the spine. Two opposing forces on the spine result in compression down the spine. If you’ve got a crummy spinal disc. it’s a risk. So do your crunches (with bent knees) but keep your feet free!